Professor the Hon Gareth Evans gave a lecture to Global Strategy Forum on Tuesday 18th October. 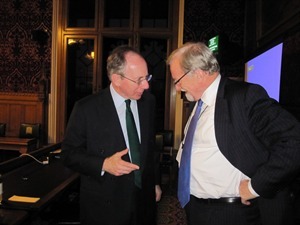 It took place in Committee Room 10 of the House of Commons and was chaired by GSF Advisory Board member, Sir Malcolm Rifkind QC MP. Professor Gareth Evans, Co-Chair of the International Commission on Nuclear Non-Proliferation and Disarmament, President Emeritus of the International Crisis Group and former Australian Foreign Minister, gave an address to Global Strategy Forum entitled‘Nuclear Weapons: The State of Play’. The event was chaired by GSF Advisory Board member, Sir Malcolm Rifkind QC MP, a member of the Top Level Group of UK Parliamentarians for Multilateral Nuclear Disarmament & Non Proliferation. In his address, Gareth Evans assessed the good news in terms of policy toward nuclear weapons, namely that in the last few years, there has been an increased high level effort at getting policy-makers to address the issue of nuclear disarmament, including a more constructive NPT Review Conference last year; but that the bad news was still considerable: stalemate in the US on ratification of the Comprehensive Test Ban Treaty, lack of progress on further bilateral nuclear arms reductions, no disarmament discussions with China; and the situation in Iran and North Korea and the Middle East remaining potentially very dangerous. He said that the ‘air had seriously gone out of the nuclear disarmament balloon’ and outlined a number of ways in which the non-proliferation and disarmament agenda could be re-energised and momentum regained, saying that crucial task was to get nuclear disarmament ‘back to the centre of the global policy agenda, and to keep that agenda moving forward’, bearing in mind that this was not just another difficult policy issue:‘Nothing less than the fate of this planet of ours hangs on us getting this right. It’s not a matter of our children and grandchildren not forgiving us if we get it wrong. It’s a matter of whether they’ll be around at all. Click here to download the text of Gareth Evan’s lecture.